It’s Spring – Time to Watch Bluebirds in Portland Oregon! Can we believe it? Is it finally spring on Chehalem Ridge? The answer is a definite yes. While we’ve been hearing bluebirds and occasionally sighting a few, the definite yes comes because our local Birdman, Greg La Haie, is and has been on his weekly runs, cleaning nests and finding real signs of spring. We’ve lived up here for almost 31 years and love to hear the first blue birds, then see them and then begin to feed them. Over the years I’ve learned to call them to dinner. We’ve lived through good and bad years and the damn swallows, but there is nothing like the first sight of momma and poppa on the railing of the deck. We’re originally from the Midwest. In Missouri we had bright red birds, Cardinals, yes and a baseball team by that name. 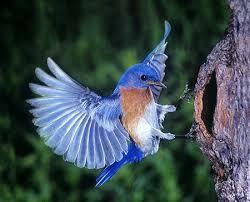 We had very bright blue Eastern Bluebirds and they were in such abundance we just got used to them. We moved to Oregon in 1960, lived in the Sylvan area for about 25 years then headed back toward space and country side. But…….no blue birds or cardinals we thought. Then one day a person visited who saw a bird box we’d taken from a falling down fence near our “barn”. She said it was a bluebird box and she knew who made it, she did! Told us there were bluebirds in Oregon and we, who had never thought about it got excited. Tried the box and learned how to tempt them. OK, they aren’t bright blue, but at least the male’s colorful and not so shy, especially if you are between them and meal worms. Three days ago I saw and heard them in the trees and when I whistled they came to eat. It is spring! You can Help! It’s Fun. Click for more info. Thank you to Morgan Pope for this Post. Morgan Pope has lived in western Washington County on rural acreage in a 100+ year old farmhouse. 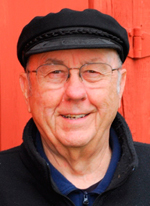 Morgan became aware of the PBRP effort in 1986 when he moved to the Oregon Countryside. He is a retired physicist, and has worked for Portland State University as Vice President. He learned of the Prescott program in 1986 from Kit Whittaker. Both Morgan and Kit are still involved with the recovery project to this day.